We have just returned from one of my favourite places on earth - the Kgalagadi Transfrontier Park. Many of the shots you would have seen from my portfolio were taken there. We had an amazing time and saw cheetahs and lions every day. Obviously some sightings were better than others, but that's the way it goes. While I dive into the mountain of images I brought back, here's a shot I took during our trip there in June 2010. 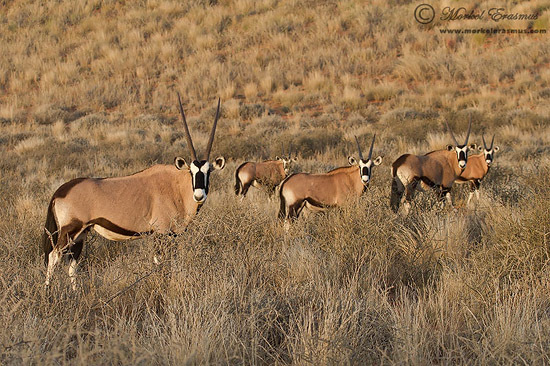 I just love the symmetrical poses in this herd of Gemsbok (Oryx), and of course the sweet morning light.